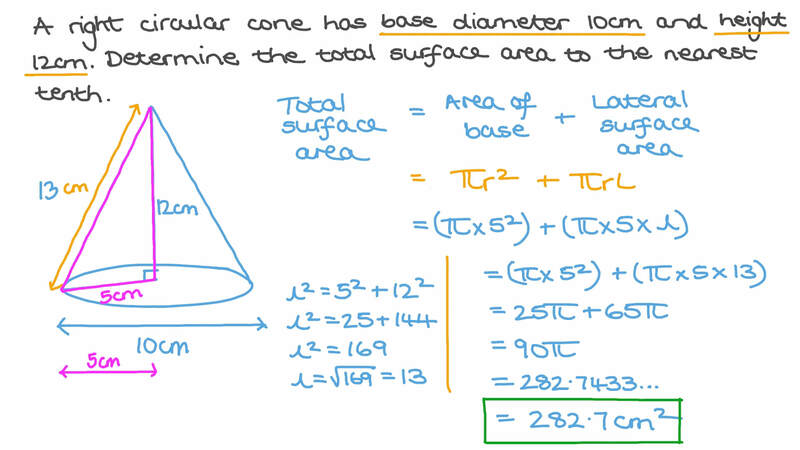 In this lesson, we will learn how to find the lateral and total surface areas of a cone using the formula. 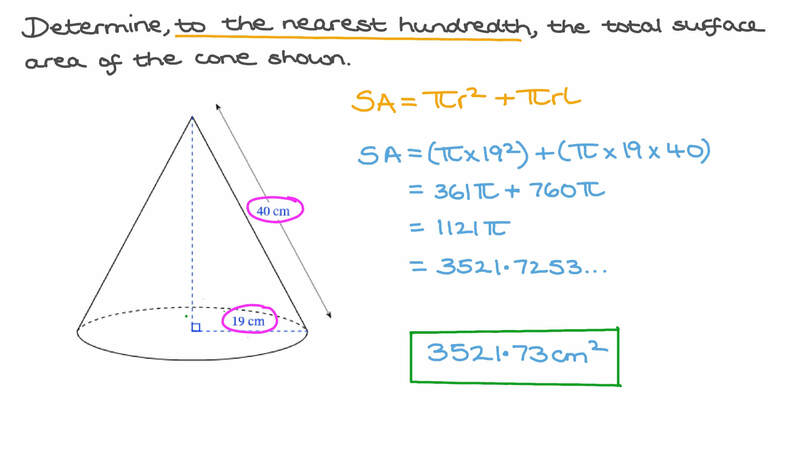 Determine, to the nearest hundredth, the total surface area of the cone shown. A right circular cone has base diameter 10 cm and height 12 cm. Determine the total surface area to the nearest tenth. A right circular cone has height 90 cm and slant height 106 cm. Find the circumference and area of the base in terms of 𝜋 . The radius of the base of a right circular cone is 27 cm and its slant height is 38 cm. What, in terms of 𝜋 , is its total surface area? 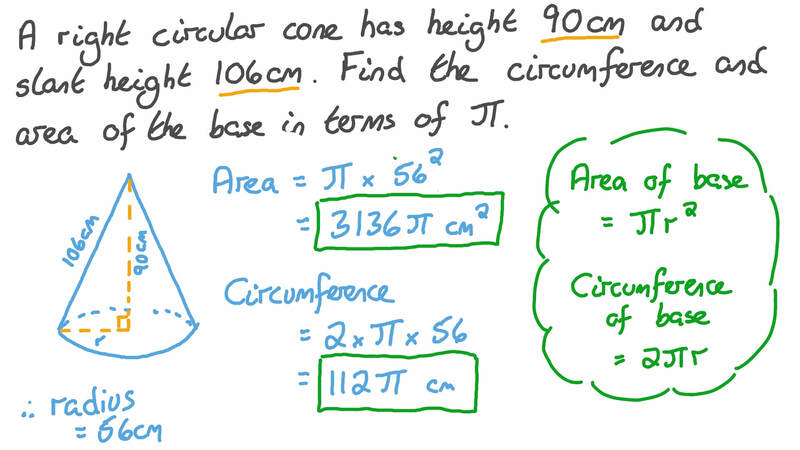 Find, to the nearest hundredth, the total surface area of the given cone. A conical lampshade is 31 cm high and has a base of circumference 145.2 cm. Find its surface area to the nearest square centimetre. Find, in terms of 𝜋 , the lateral area of a right cone with base radius 9 cm and height 13 cm. Given that the height of the shown cone is 88 cm, and s i n 𝜃 = 3 5 , determine the surface area of the cone in terms of 𝜋 . Find the total surface area of the right cone approximated to the nearest two decimal places. A right cone has slant height 35 cm and surface area 4 5 0 𝜋 cm2. What is the radius of its base? Find, to the nearest tenth, the lateral area of a cone with a diameter of 40 centimetres and a slant height of 29 centimetres. Find, to the nearest tenth, the surface area of a cone with an altitude of 76 feet and a slant height of 95 feet. Two similar cones have radii of 5 millimetres and 10 millimetres. What is the ratio of the surface area of the small cone to the surface area of the large one? 𝐴 𝐵 𝐶 is an equilateral triangle of side length 𝑙 . Given that it turned one complete revolution about 𝐵 𝐶 , determine the lateral area of the solid generated by the rotation in terms of 𝜋 and 𝑙 . Find the surface area of the given cone to the nearest tenth. Find, to the nearest tenth, the surface area of this cone. A piece of paper in the shape of a circular sector having a radius of 72 cm and an angle of 2 7 5 ∘ is folded in a way so that the points 𝐴 and 𝐵 meet to form a circular cone of the greatest possible area. Determine the cone’s height to the nearest hundredth. A conical mountain has a radius of 1.5 km and a perpendicular height of 0.5 km. Determine the lateral area of the mountain to one decimal place. Determine, to the nearest square centimetre, the surface area of a right cone whose slant height is 73 cm and height is 61 cm. The surface area of a cone is 3 6 4 𝜋 square inches, and the radius of the base is 13 inches. Determine the slant height of the cone. A sheet of paper in the shape of a sector of radius 29 cm and area 2 0 3 𝜋 cm2 is folded into a right cone, by gluing together the radii 𝐴 𝐵 and 𝐴 𝐶 . What is the height of the cone? Recall that the sector area is given by half the product of its radius and the length of its arc. Karim cuts a slit in a circular piece of paper and then rolls it into a cone so that the sides of the cone are two sheets thick. What is the apex angle of the cone? A circular sector of radius 135 and angle 1 2 0 ∘ is folded into a right circular cone. What is the height of this cone? Two similar cones have surface areas of 768 and 363. What is the ratio of the height of the larger cone to that of the smaller one? Given that the following net describes a solid of volume 2 0 , 4 8 0 𝜋 cm3 and that the length of 𝐵 𝐶 is 6 4 𝜋 cm, determine its total surface area in terms of 𝜋 .